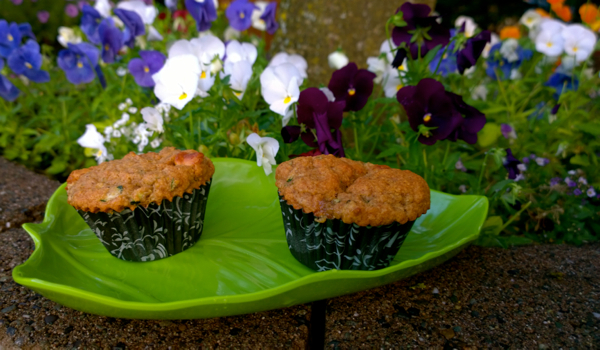 I had serious zucchini issues, and making a jumbo batch of muffins used up quite a bit of it. And since they freeze well, a big batch makes school lunches a breeze! After grating the zucchini, let drain in a fine mesh strainer over a bowl, pressing gently to remove any extra moisture. Grind the oats in a blender or food processor, into a flour. Preheat oven to 350°, line 2 12-count muffin tins with liners. In a medium bowl combine oat flour, 2 teaspoon baking powder, salt, baking soda and cinnamon, stir with a whisk. In a large mixing bowl whisk together the applesauce, remaining baking powder, flaxseed meal, oil, maple syrup and milk till smooth. Mix dry ingredients into applesauce mixture, one half at a time. Stir in zucchini and chocolate chips. Divide batter into muffin pan, the muffin tins will be nearly full. Bake for 30 minutes, or until a toothpick interested in the middle of a muffin comes out clean. The muffins will feel soft, but will firm up after cooling. Leftover muffins can be frozen.